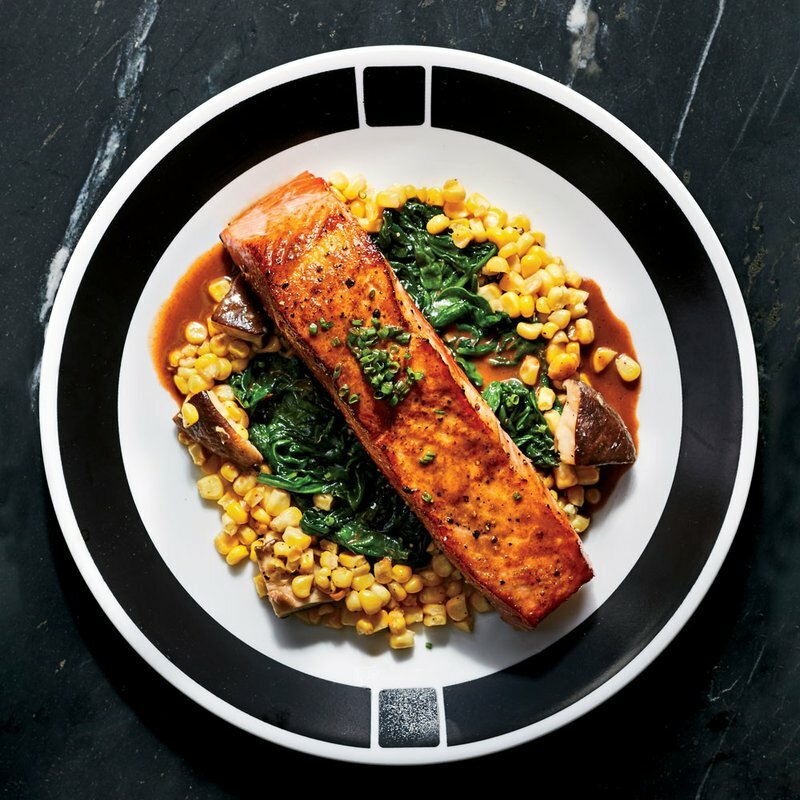 This simple seared salmon is paired with summer vegetables for a classic, light meal. [post_ads]Cut 6 tablespoons butter into 1/2-inch cubes, and refrigerate until ready to use. Melt 2 tablespoons butter in a medium nonreactive saucepan over medium-low. Add onion, sliced garlic, shiitake stems, tomato, black peppercorns, and bay leaf, and cook until vegetables are soft but not brown, about 12 minutes. Add balsamic vinegar and 1/3 cup water, increase heat to medium-high, and cook, stirring occasionally, until mixture is syrupy, about 4 minutes. Reduce heat to low, and add cubed butter, 2 to 3 pieces at a time, whisking thoroughly between additions. Season sauce with salt and pepper to taste. Pour sauce through a fine wire-mesh strainer into a bowl; discard solids. Keep sauce warm over a double boiler. Spear whole garlic clove with a dinner fork. Heat 2 tablespoons olive oil in a large skillet over high until just beginning to smoke. Add spinach; cook, stirring using fork with garlic clove, until spinach is wilted. Season with salt and pepper to taste; transfer to a colander to drain. Discard garlic clove. Wipe skillet clean with paper towels. Reduce heat to medium, and add 3 tablespoons butter. Add shiitake caps, and cook, stirring, until softened, about 3 minutes. Stir in corn kernels; cook until completely heated through, about 3 minutes. Season with salt and pepper to taste. Transfer to a bowl, and keep warm. Increase heat to high, and add remaining 1 tablespoon butter and remaining 1 tablespoon olive oil to skillet. Season salmon strips with salt and pepper to taste. Add fish to skillet, and cook until browned but barely cooked through, about 3 minutes per side. Divide spinach among 6 plates; surround with corn and shiitakes. 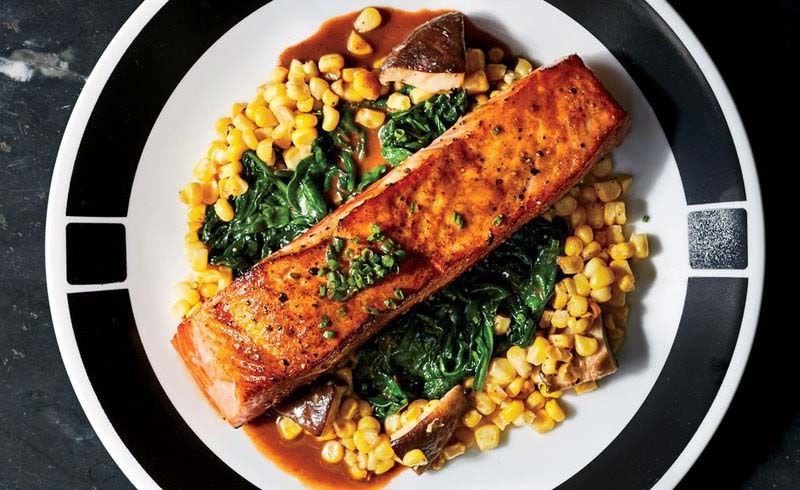 Place a salmon strip on top of spinach, and spoon vinegar sauce on fish. Garnish with a sprinkling of chives; serve immediately.